Illustration - Page 2 of 7 - io design & illustration, inc. Illustration services include both hand drawn and computer based artwork. Specific projects include children's book illustrations, greeting cards, wedding invitations, posters and screen print art. Illustration is also a strong component in many packaging design projects and logos we have developed. Below are some examples of illustration focused projects. 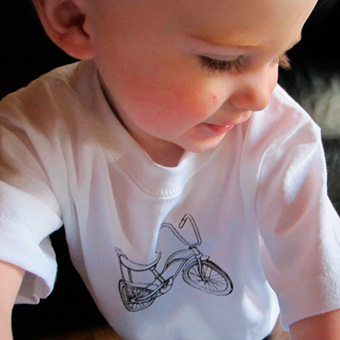 Banana bike illustration on t-shirt. Photo courtesy Roly Poly Crafts. I just competed a series of line drawings for Roly Poly Crafts to screen print on garments: t-shirts, baby one-pieces, diaper covers and the like. Roly Poly owner, Ruth, has a wonderful sense of hip nostalgia in the selection of images she asked me to draw for her. The illustration style is line art, with no shading, designed to be printed in one color. Illustrations include a banana seat bicycle, high top sneakers, a prancing unicorn, a folk/country singer, iconic trees, and “Mixed Tape” cassette. Seasonal Wreath, starting from 12 o'clock position, clockwise: Violet (faithfulness), Dogwood (love undiminished), Dandelion (wishes come true), Lily of the Valley (happiness), Baby's Breath (festivity), Azalea (romance), Gardenia (peace, joy), Sunflower (loyalty), Oregano (creativity), Rosemary (wisdom), Tiger Lily (wealth), Goldenrod (good fortune), Oak (longevity), Ivy (wedding love), Pine (fertility), Honeysuckle (bonds of love). I love working with pen & ink and ink wash. Something about dipping a pen in ink and setting it to paper, watching as you draw a line how subtle changes in pressure and angle manipulate the flow of ink, puts Zen in my day like nothing else. Weird since it is an irreversible process and one error can mean reworking an entire piece. Unfortunately, I don’t get to create with pen & ink very often, so when I do it is a special treat. The Seasonal Wreath (actually I have created three similar images each with unique fauna) is a large scale illustration measuring approximately 16 inches across. 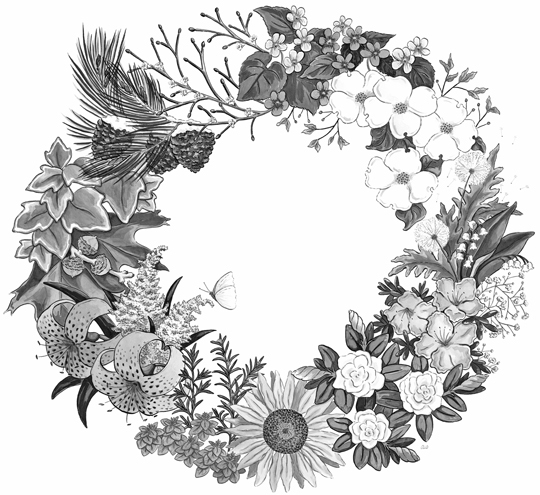 It represents many hours of work, from pencil sketching and refining, to inking the lines and adding the tonal wash.
Each wreath represents the seasons as you move clockwise around the illustration – spring, summer, fall, winter. The piece shown here is focused on Eastern US flowers and plants. The selection of plants illustrated was a combination of requests from a bride-to-be, some of my personal favorite flowers and a book which lists the historic meanings associated with certain plants. The final image was reproduced as a wedding invitation with the wreath image on the front and the traditional meanings listed on the back.